Summer time is here, kinda sorta, not quite as June 20 is the Summer Solstice, but it feels like it’s summer although so far we’re not nearly as hot. We hope it stays that way although they are saying this year is going to be one of the hottest Summers on record. Thankfully, we have yet to break 100 F so this year. Considering that last year we initially broke 100 F in April, almost every day in June, EVERY day in July, a most days in August, it will take a monumental heat wave from this point forward to top 2011. While it still can happen, I have my fingers crossed those crazy meteorologist are once again mistaken. 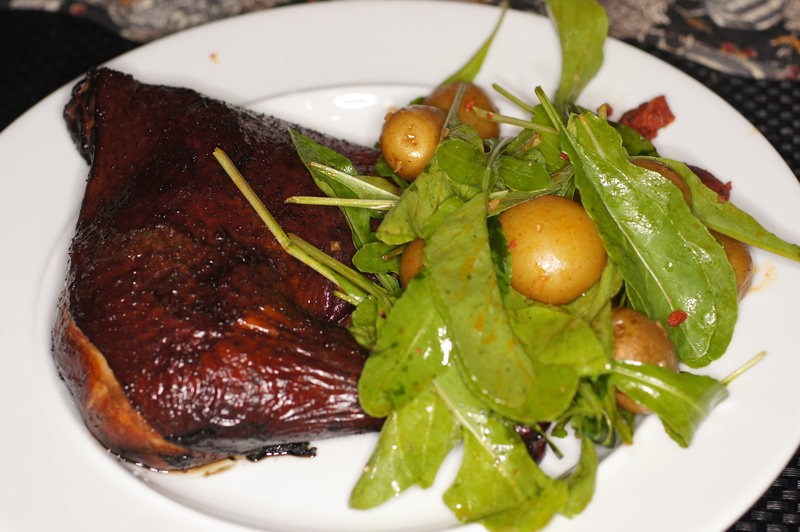 Given that it is still nice enough to cook outdoors, something summer is all about, and Baby Lady wanted Warm Potato, Arugula, Linguica Salad with Smoked Paprika Vinaigrette, I decided the perfect accompaniment would be smoked chicken. We really like barbecue and not commercial barbecue. There is something about back yard barbecue that makes it special. Perhaps it’s the smell of the smoke wafting all over the neighborhood making your neighbors hungry and wishing they were having dinner with you. Perhaps its because I get to control the wood used to smoke the meats. Perhaps its the simplicity of it all. Very few seasonings and just the smoke. I think its because I bought the smoker and love to play with my food. 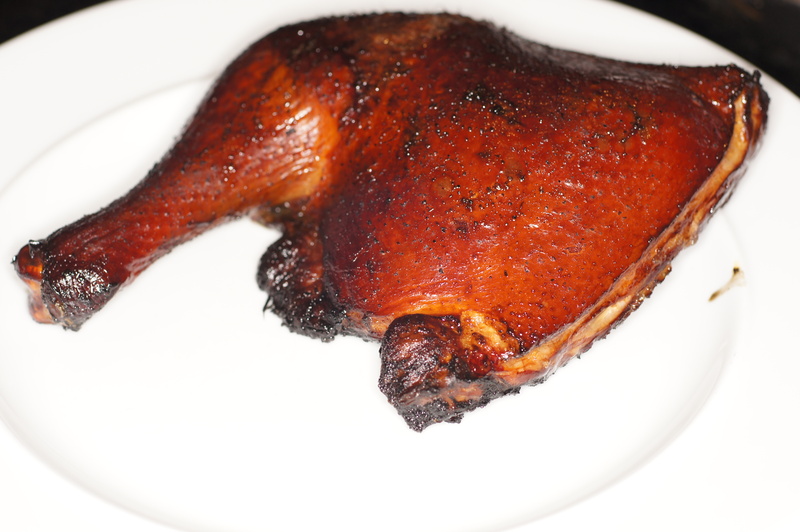 So, we got out the trusty welding torch, heated up some mesquite charcoal and laid on a couple of large sticks of pecan wood to smoke some chicken quarters. Being extravagant, I only cooked 2 chicken quarters. I know, what a waste of wood, but I got a late start on the day and brisket was out of the question as were ribs and I didn’t have several whole chickens laying around. 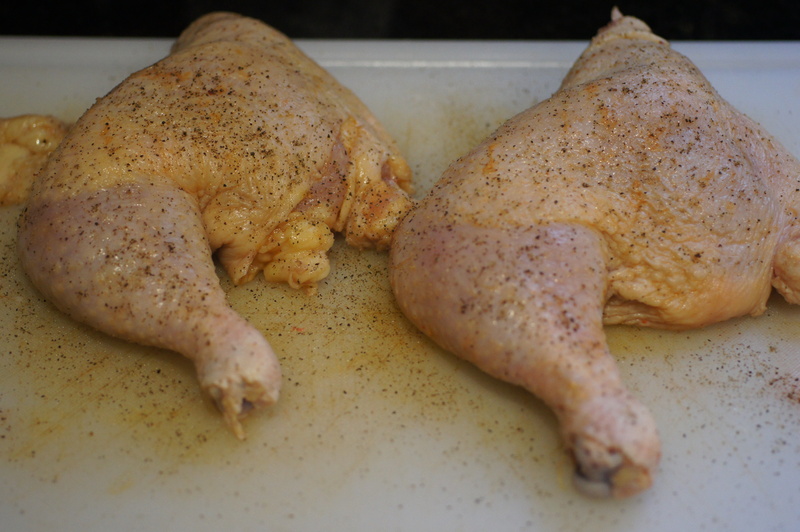 We seasoned the chicken solely with salt and pepper just to allow the smoke to do its thing. 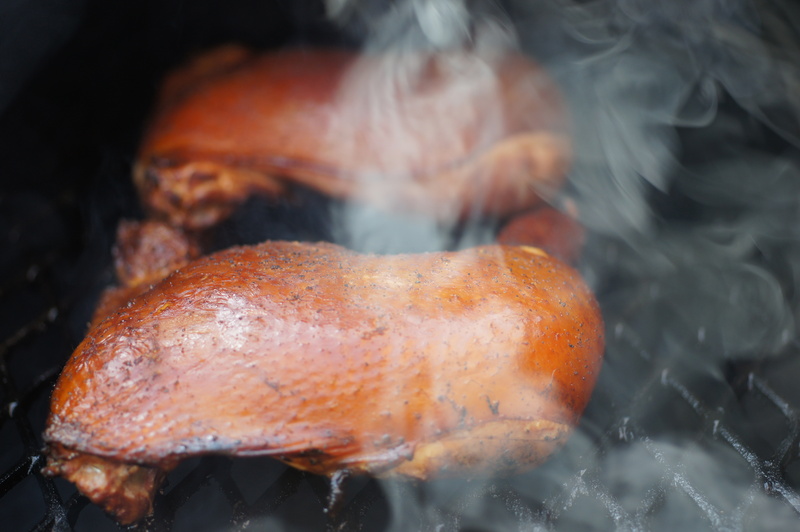 It’s the smoke that makes great barbecue. 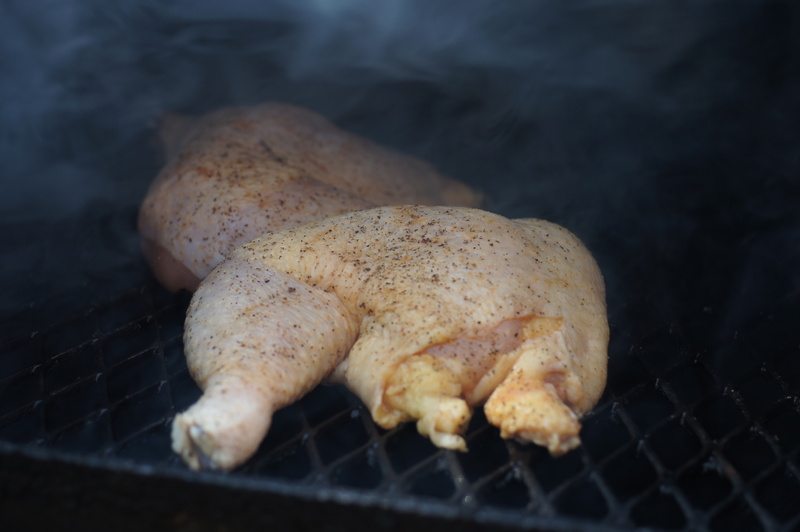 When the temperature reached 250 F, I put the chicken into the smoker nearest to the fire box. Then I walked away and ignored the chicken quarters. After about 1-1/2 hours I came back to check on them and they were turning a beautiful shoe colored brown. Doesn’t that make you hungry? It did me but there wasn’t anything I could do about it because they still needed an hour to go. Knowing we were getting close, I went back into the kitchen and started the Warm Potato, Arugula, Linguica Salad with Smoked Paprika Vinaigrette. Combine all of the ingredients in a mason jar and shake like crazy to emulsify. 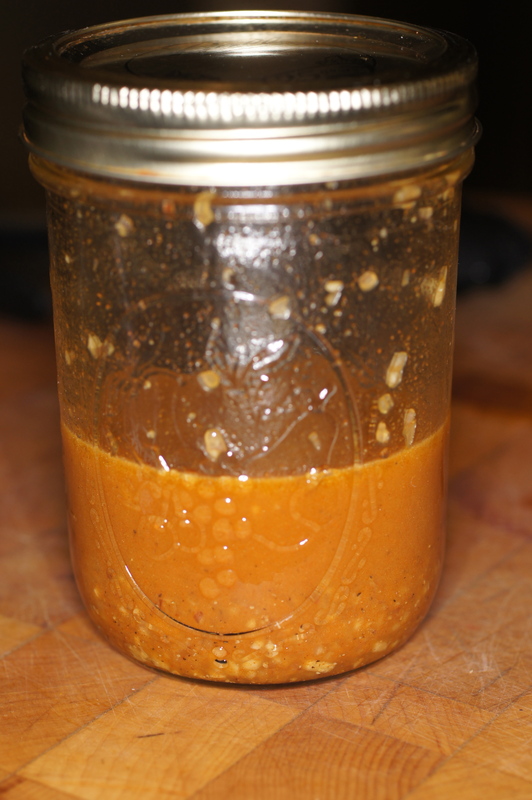 This is really simple and produces a wonderful vinaigrette. I personally like the flavor of La Chinata Smoked Paprika. It has a fabulous smokey flavor, can be used sparingly and comes in 3 types 1) Sweet; 2) Bittersweet; and 3) Hot. All of them a killer and really make this vinaigrette. I used the bittersweet tonight but have used the hot in the past. Cook the potatoes until just done. 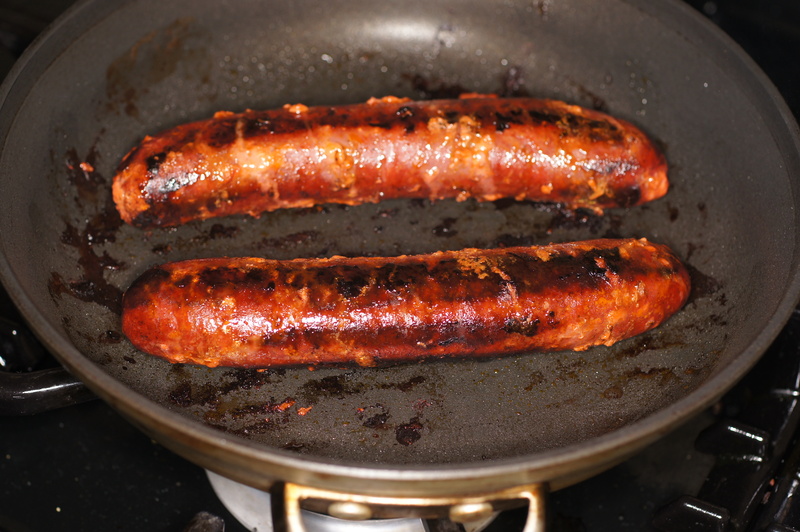 Cook the linguica over medium low heat in a skillet. When done, crumble into small pieces, roughly 1/2 inch. In the meantime, clean the baby arugula. This was freshly picked from our garden. You can’t get better than this. 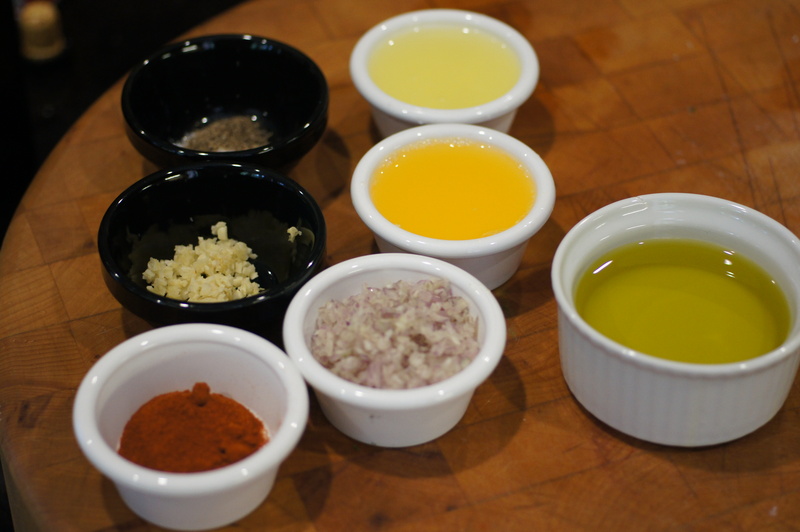 Add 1 Tbsp oil to a sauté pan and heat the oil. Add the crumbled linguisa and potatoes to heat through. 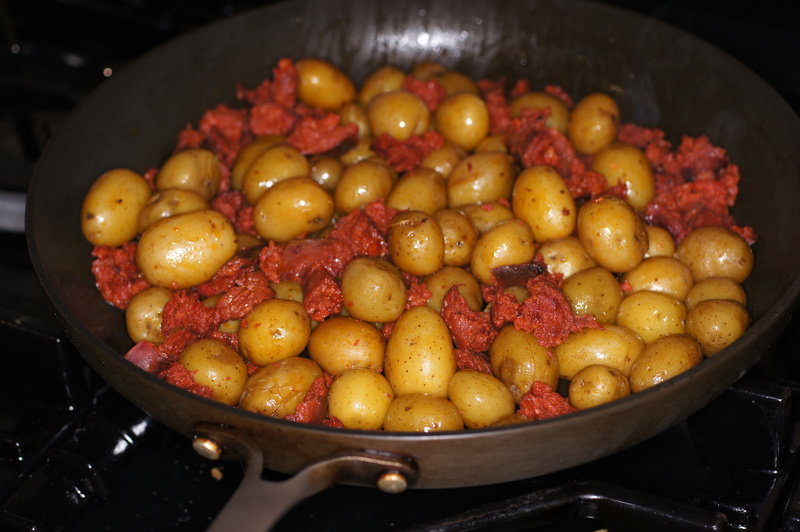 When heated through, add the potatoes and chorizo to a large bowl. 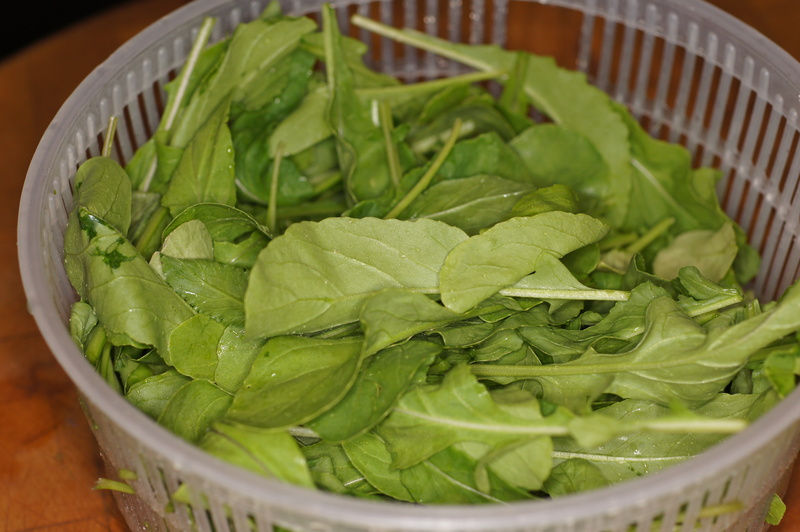 Add the arugula and 6 Tbsp of the Vinaigrette and toss to incorporate. Plate the salad on the side of the chicken. Serve and Enjoy. We did! I love the color of the chicken, and your salad is already a meal in itself. Never thought about putting sausage in salad, but all that flavor and seasoning would really change it up. Looks great! Thanks for your nice comment. Warm salads are the perfect foil to throw in various meats, especially spicy sausage like linguica or chorizo. 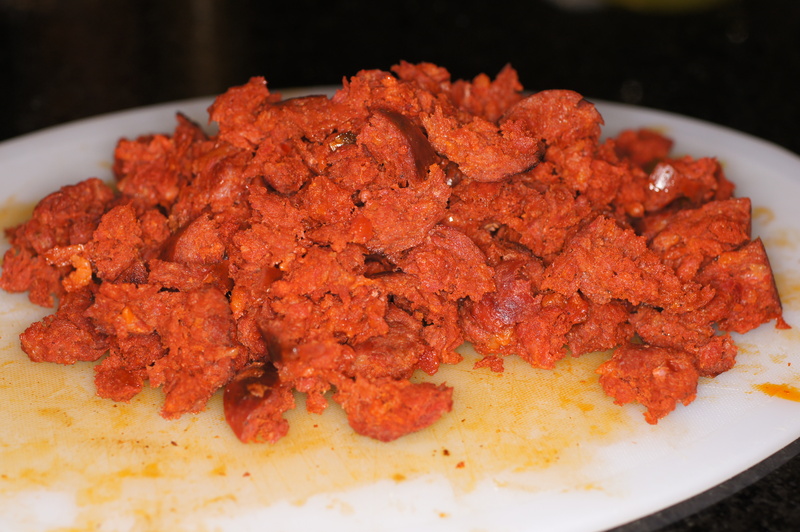 We prefer the linguica because of its lower fat content. If you can get true chorizo out of Mexico instead of the nasty greasy stuff sold in the US markets, it doesn’t have nearly as much fat. The warm potatoes and linguica cause the arugula to wilt a little and the bitterness of the arugula is the perfect counterbalance to the sausage, potato and smoke paprika vinaigrette.